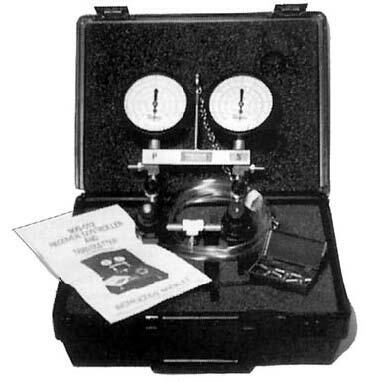 Magnehelic® Air Velocity Kits contain gauge in plastic carrying case, with aluminum stand, two 1/8" NPT to rubber tubing adapters, 9 foot length of 3/16" tubing, and brass terminal tube. 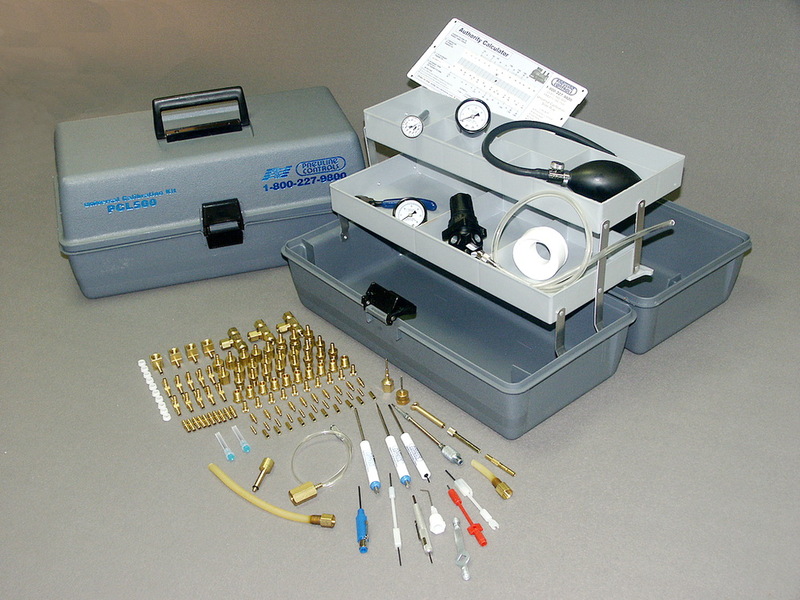 Use with pitot tube (order separately) for air velocity measurement, or without pitot tube for pressure measurement. Magnehelic gauges are less sensitive to level than liquid, yet offer accuracy to ±2% over the full scale. 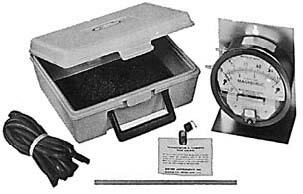 Air Velocity Scale provides direct reading without conversions. They are handy to use on a ladder or in confined locations. Provides exceptionally responsive, consistently accurate indication of air velocity, positive, negative or differential pressures. Our most popular precision air velocity instrument, the ABK400 is used to balance air conditioning systems, measure drop across filters, test fan and blower discharge and inlet pressure, as well as air velocity in ducts. Read the red figures directly in f.p.m. 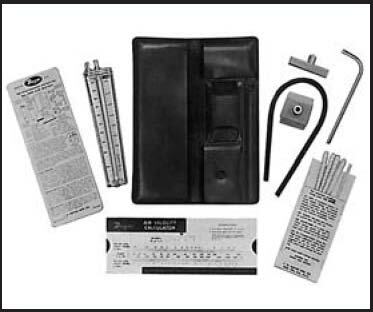 Read the black figures in inches W.C.
A versatile, all around manometer for the air conditioning and air balancing contractor or industrial plant engineer. 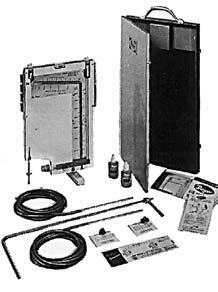 Simplest, quickest to use air velocity instrument we know of. The AVK1000 Air Meter is very popular for service work or air conditioning, heating and ventilating equipment. 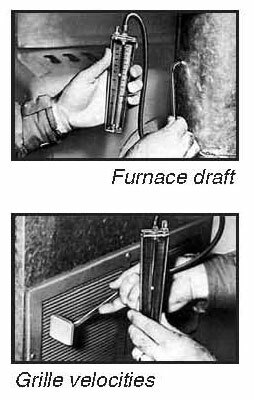 Direct reading air velocity and static pressure scales — both high and low range — show supply and return grille velocities, duct air velocities, furnace draft, pressure drop across air filters, etc. 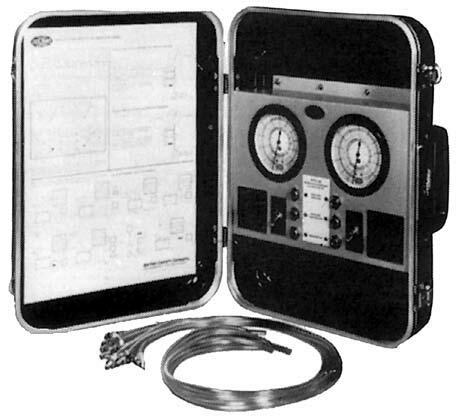 Includes air meter, return and supply grille probes, angle connector, cleaning materials, instruction card, air velocity calculator, carrying case and one extra plastic ball in plastic tube. Now you can have a solid state, digital pressure gauge with the specific range (0-30 psi) needed to set up, calibrate and troubleshoot pneumatic HVAC controls. You can now get an accurate digital readout for any positive, negative or differential pressure in your plant or building. 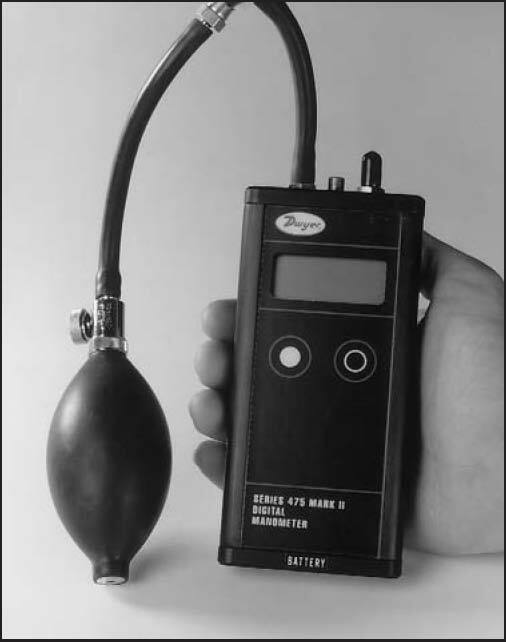 This new instrument will measure any non-corrosive liquid or gas. Get laboratory accuracy (±0.5% of full scale) with the divisions (to .10 PSI) needed to make the precise calibrations demanded by today’s Energy Management and Automation Systems. This kit comes complete with a tough grey, nylon carrying pouch which includes a convenient side compartment for tubing and other accessories. 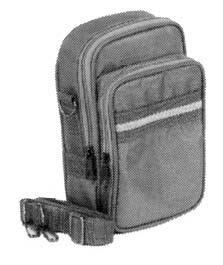 With belt loop, hand strap and adjustable shoulder strap.